Daddy hasn’t been on the old blog in a while, and I feel like he needs a little acknowledging! 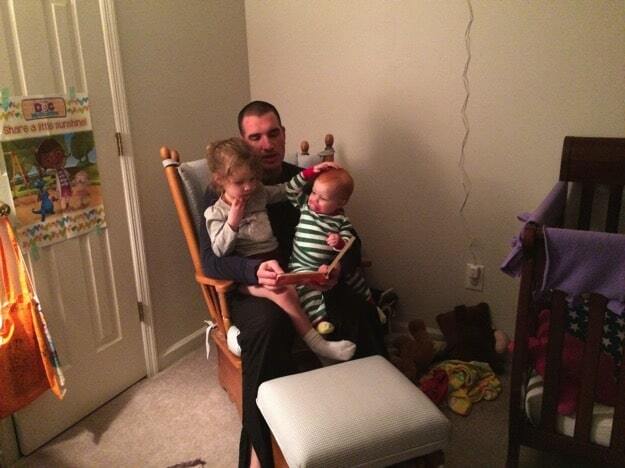 He’s a pretty good daddy and we are lucky to have him. He’s supportive and funny and not bad on the eye, either. He really loves all 5 of us. And yes, he usually has a full lap, too! Reading with these two together is pretty funny. It’s sort of like having a two-headed octopus on your lap (not that I know what that’s like). There are arms and legs everywhere. And just so I don’t break my own rules, B loves to make a kissy-face. Which apparently, is hard to capture. I think this is the tail end of hers. Me, however? Kissy-face extreme! 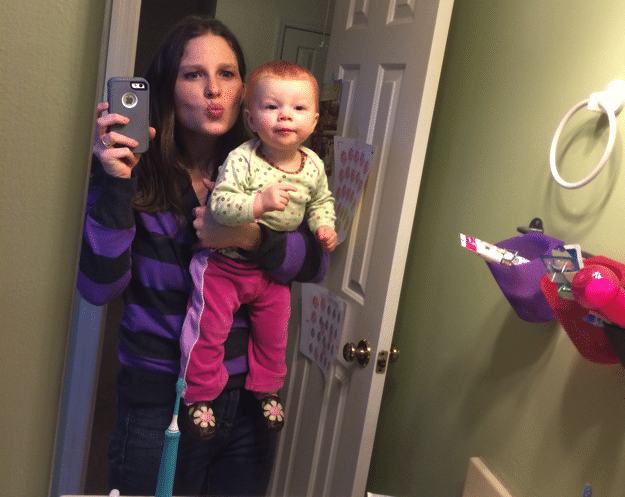 Did you capture your picture for Mommy and Me Monday and make sure you are in the picture with your little one/s? My hubby is a terrible story reader. haha. He knows I think that. He doesn’t give it any emotion or feeling. At least he does read stories. I guess some Dad’s don’t. The B kissy face! I love it! Does she kiss herself in the mirror yet? Logan does and it’s adorable! i love all my girls! I like both of those kissy faces! Cute shots!! And I love B’s little shoes. I need to find some of those for our little one on the way. Ah yes, I remember that! Great photos, I especially love the kissy faces. We do a mommy and me day to. We will go to the park and then out for a treat.